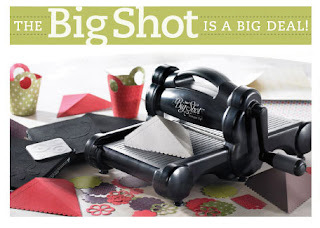 The Serene Stamper: HUGE Stampin' Up! Specials! A FREE Big Shot, and up to 80% off!!! These specials start October 1st and run through October 30th!! Don't miss out! Get a FREE Big Shot, OR $125.00 in FREE product...whatever you want!! Join now, and buy the Digital starter kit, or standard starter kit, and you will get a FREE Big shot, OR $125.00 in FREE product!! THIS is the best special ever!! The kit is already priced at 50% off! You get $425.00 in product for only $215.00...NO shipping or tax (Stampin' Up! will pay it for you)! Then, you can enjoy your discount for as long as you stay active! At least 6 months! WOOHOO!!!! Or, you can use this kit to start your own part time business, and earn a great income! Stamps for FREE, at a discount, and Money! What a deal! NO OBLIGATION!!! Anyone can buy this kit!!!! The kit contains: 4 stamp sets, 3 packs of paper, 40 sheets of Designer series paper, stamping around wheel, ink cartridge and handle, 3 markers, 4 stamp pads, envelopes, ribbon, a punch, Stampin scrub and mist, adhesive, versamark, sponge, and MORE!!! You can customize it! Or jump in to digital scrapbooking, and get that kit too! If you want help purchasing the kit, or putting in an order, just email me!!! SHOP now up to 80% off!!! Clearance rack is only available through my Online Store! There's even ANOTHER great special this month!!! Buy 2 "Simply Sent" kits and get a FREE stamp set!!! Simply go to my website to shop online now or email me your order!